It's too scaley to be Ruth, but I'd be happy with this gorgeous cake anyway! That's a seriously beautiful cake. Pern dragon or not, I would love to get it. Wonderful! 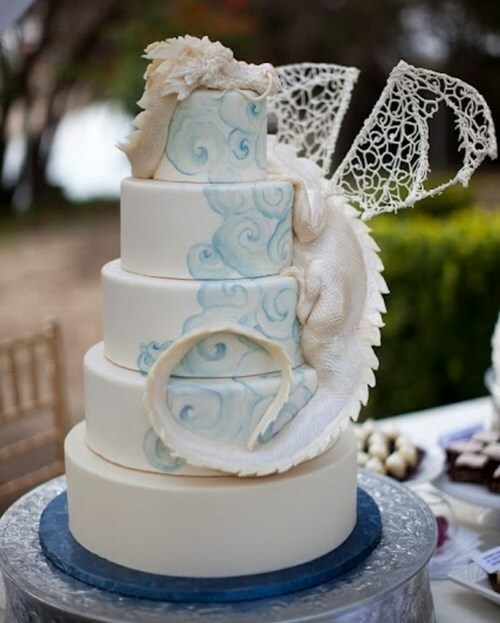 I suppose the dragon is edible? Wow! But no true dragon lover would dare, would they? I love anything"White Dragon", espically when it's edible. On second thought, it looks too good to eat. Just keep it in a glass case! WOW Cheryl...you do find the best looking cakes. THis one is one has to be one of the most beautiful I think I've ever seen...too bad it won't last, it would have been a lovely sculpture to have on display. That is wonderful! I'd hate to eat it! !